The idea of bulk purchasing power is a common concept, and while many do choose to take advantage of this opportunity to maximize the value of a dollar, there are still some big opportunities being overlooked. According to John Browne, General Manager of Roof-A-Cide, there are tens of thousands of dollars’ worth in savings that community associations are missing out on by failing to coordinate vendor services at a community level. Browne notes that the majority of communities in Southeast Florida have been benefitting from this concept for decades, and he hopes that associations all across the Sunshine State will soon begin to take advantage of the tactic as well. “Our community negotiated a bulk cable agreement that saved each of our residents $50 per month. Since we have about 300 homes, this translates into $50 x 300 x 12 for a total of about $180,000 per year. “We work with a community of 150 homes that requires their homeowners to keep the homes painted. Each homeowner was spending approximately $2,200 every five years to paint. By coordinating the painting, the homeowners saved $900 per home totaling $135,000. Now the painting is uniform, scheduled to minimize disruption throughout the community, and the homeowners have paint warranties ranging from 7–10 years. This cuts their effective costs by approximately 40 percent. In a time when boards and managers are under perpetual pressure to keep dues and assessments low, when budgets are routinely studied to find ways to cut costs, passing up on an opportunity for substantial monetary savings could be detrimental to both communities and their management. 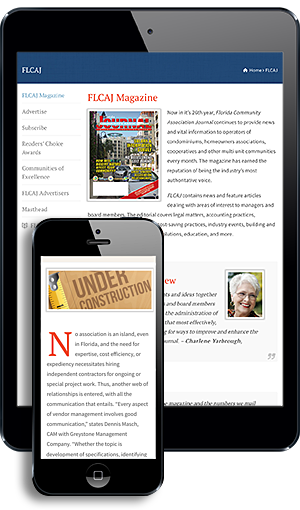 With years of experience in providing services to community associations in Florida, Browne understands that some people are naturally resistant to change, and sometimes community boards and managers are reluctant to take on any responsibilities that are not specifically spelled out in the governing documents. However, he has witnessed the multitude of benefits resulting from a coordinated, bulk purchasing approach, and is working with professionals in the industry to try to promote the concept. As a member of the Community Associations Institute (CAI) and Florida Community Association Professionals (FCAP), Roof-A-Cide is invested in bringing positive development to the profession. “By implementing some, or all, of these measures, board members and managers will be setting the standards in property management in their areas and better serving their communities by lowering overall costs and maximizing the value of community,” says Browne. The bulk purchasing technique worked so well for them with roof maintenance, they decided to use the same method with sealcoating the community’s 24 parking lots. Ayers notes that providing uniform maintenance for all areas at once keeps the residents happier as well. “This approach has worked for us, and I hope that it can work for others out there as well,” Ayers says. She realizes that not every association has reserves that can cover bulk purchases, but thinks the benefits are enough to warrant an adjustment of the budget. In Lake Worth, the Villaggio Homeowners Association is also taking advantage of their buying power. The association’s general manager, Lacy Carr, notes that besides the obvious monetary savings, aesthetics, convenience, and accountability are also increased. “This tactic im-proves property values, and provides an easy option, especially for seasonal residents,” Carr says. “It also helps to keep the homes up to community standards, which decreases violations and improves the overall appearance of the community. Residents also benefit from contracting with a vendor that has been fully vetted by the association ensuring they have all appropriate insurance coverage and licenses. People are getting quality work for less money than they would be able to get when independently contracting with a vendor.” Villaggio uses bulk contracting with their cable TV services, landscape and tree services, roof cleaning and maintenance services, and mulching. As Browne works to promote this concept throughout Florida, communities like the Villaggio and Palm Greens are appreciating the benefits. With a high level of satisfaction among residents and management alike, Browne believes this approach will not only transform the experience of implementing required maintenance projects, but drastically reduce the costs as well.